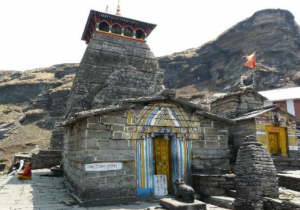 The temple of the Bridha (old) Badri is located at Animath, 7 km from Joshimath in the direction of Pipalkoti. Before Badrinath was designated one of the four dhams, the idol of Badrinath was worshipped here. It is said that when mankind entered the age of Kaliyug, Vishnu chose to remove himself from the temple. Interestingly, the image was found by Adi Guru Shankaracharya at Narad Kund, and restored, though part of it remains damaged. The climb to the temple is through cultivated land and past Malta Groves. A very huge Bayan tree shelters the temple. Legend has it that the god, Vishnu disguised as Bridh (old) person played with Ganeshji during period of his childhood. Getting there: Jolly Grant at Dehradun is the nearest airport. 247 km away Rishikesh is the railhead. Animath 7 km short of Joshimath, is accessible by motorable road from Rishikesh on Badrinath route. Joshimath 7 km is the centre with the private hotels and Govt. accommodation.